Stellar nurseries are cloudy and dusty places that shine brightly in infrared light. The G305 star-forming complex is no exception. 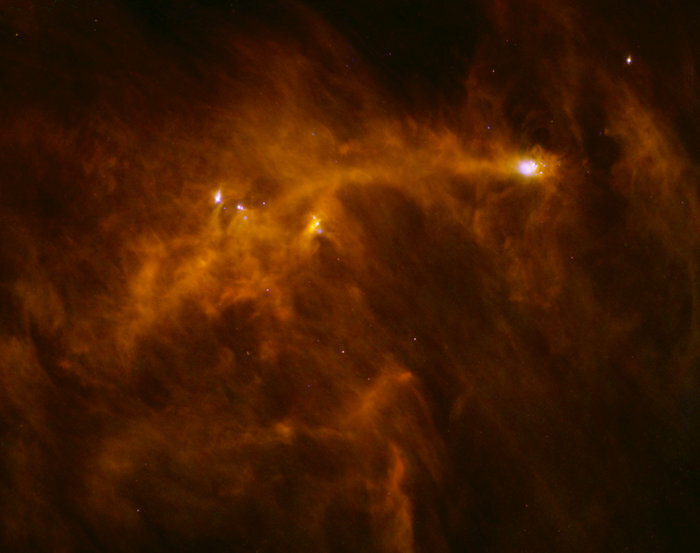 It features a number of bright, intricate gas clouds heated by infant stars in their midst. 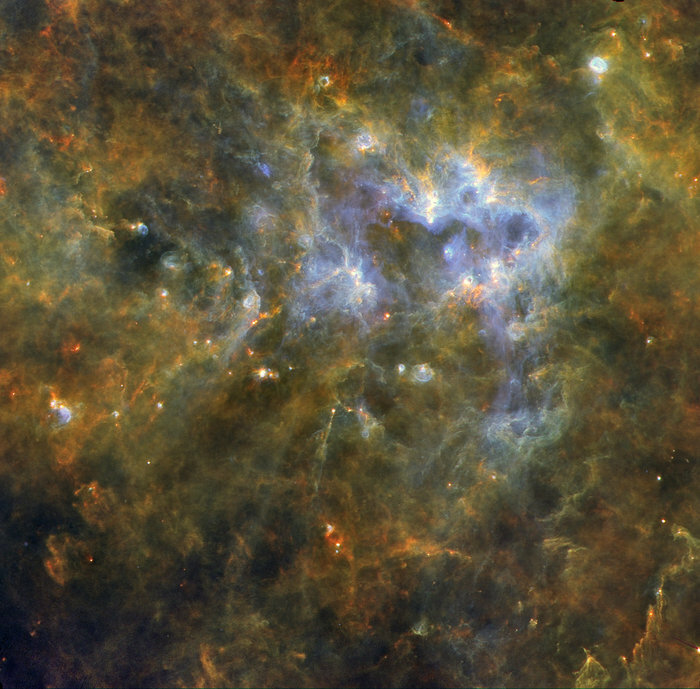 In this spectacular image by ESA’s Herschel space observatory, these star-forming hotspots stand out in a blue tone that contrasts with the red-brownish colour of cooler regions. Using Herschel, astronomers have identified 16 sites [MNRAS] where high-mass stars are forming in this stellar nursery. The region is one of the brightest and most plentiful star-forming complexes in the Milky Way, and an ideal ground to observe and study massive stars at different stages of formation and evolution. “There is no longer any need for a violent process that moves a galaxy rapidly from one class to the other. One of the gravitationally lensed sources found in the survey. The ring is a map made with the Atacama Large Millimetre Array of one of the sources detected in the survey. The ring is an ‘Einstein ring’ made as the result of the bending of light from the distant Herschel source as the result of the gravitational field from a nearby galaxy (the galaxy in the centre, which was not detected by Herschel). We are an ambitious and innovative university with a bold and strategic vision located in a beautiful and thriving capital city. Our research is world-leading and we provide an educationally outstanding experience for our students. This image was first published in a paper by Á. Ribas et al. (2013) [Astronomy & Astrophysics], which presents a study of protoplanetary discs in this region. It was also shared as a #HerschelMoment during a public campaign on Twitter to celebrate the legacy of ESA’s observatory in September 2017. Delving deep into the history of our cosmos, the Herschel Space Observatory scrutinised hundreds of thousands of star-forming galaxies, peering back in time to when the Universe was less than one billion years old. These observations probed the peak epoch of stellar production, about ten billion years ago, when galaxies were forming stars roughly ten times faster than their present counterparts. Shortly after the Big Bang – the hot and dense phase that sets our cosmic tale into motion – the Universe was very different from what we can observe nowadays, and it took a few hundred million years for stars and galaxies to start to emerge from the primordial ‘soup’ that filled the early cosmos. As a result of the dust interspersed in the interstellar material, galaxies emit roughly 50 per cent of their total light at mid-infrared, far-infrared, and sub-millimetre wavelengths –between 8 micron and 1 mm – with a peak in the far-infrared, around 50-200 microns. For this reason, observations in this spectral range are fundamental for quantifying a galaxy’s star formation activity. Performing observations at infrared wavelengths with telescopes on the ground, however, is generally difficult – if not impossible – because of the presence of Earth’s atmosphere, so astronomers turned to space. 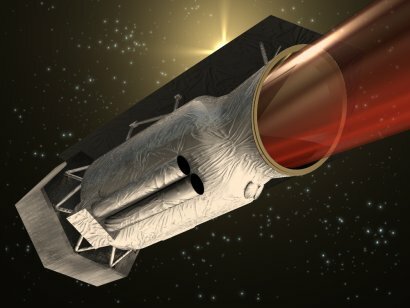 In the early 1980s, the US-Dutch-British Infrared Astronomical Satellite (IRAS) was the first space mission to map the sky in the far-infrared, followed by ESA’s Infrared Space Observatory (ISO) in the late 1990s, NASA’s Spitzer Space Telescope, launched in 2003, and JAXA’s Akari, which operated between 2006 and 2011. With mid-infrared observations from ISO and Spitzer, astronomers started to perceive the glow of warm dust from individual star-forming galaxies sprinkled across the Universe’s history. But it was only with ESA’s Herschel Space Observatory, launched in 2009 and operational until 2013, that these investigations unleashed their full potential. The observatory’s broad spectral coverage, including the far-infrared and sub-millimetre range, extended to longer wavelengths than those probed by Spitzer, ISO, and Akari. As a result, astronomers could sense cooler dust than that which had been detected by its predecessors. Scrutinising the evolution of galaxies was the focus of various Key Programmes that dedicated over 2000 hours to these observations – among them, the Herschel Multi-tiered Extragalactic Survey, the PACS Evolutionary Probe, and the Herschel Thousand Degree Survey. Following in the footsteps of previous studies based on Spitzer data, Herschel allowed astronomers to resolve the diffuse ‘fog’ known as the cosmic infrared background radiation into hundreds of thousands of individual, actively star-forming galaxies, seen as they were at a variety of past epochs. Herschel’s contribution was crucial to push the observations up to the time when the Universe was less than one billion years old, probing the full period when star formation peaked and even beyond. Measuring how bright a galaxy shines in the far-infrared can inform astronomers about how much dust is there and how cool it is, which can be used, in turn, to determine the pace of the galaxy’s star formation activity. Most galaxies in today’s Universe are making stars in a steady, gentle fashion, and only rarely do dynamical interactions of galaxies, or mergers, trigger the occasional, intense burst of stellar birth. In spite of their higher production rates, most galaxies at earlier cosmic epochs seem to be quite ‘ordinary’: their greater productivity is likely an effect of cold gas – the raw material to make stars – being more plentiful at those times. In addition, Herschel demonstrated that, at any given time in the Universe, the vast majority of star-forming galaxies seem to obey a very simple rule: the greater the mass of stars hosted in a galaxy, the faster this galaxy is forming new stars. This relation, called the Galaxy Main Sequence, had already been identified using Spitzer observations of galaxies in more recent epochs, but Herschel confirmed that it applies also to earlier times. The answer to some – or perhaps all – of these questions might lie in the ‘feedback’ effects exerted on the interstellar material that pervades a galaxy by stellar radiation and winds, supernova explosions, and outflows possibly triggered by the activity of its central black hole. Using Herschel data, astronomers discovered massive outflows of molecular gas streaming away from the cores of several star-forming galaxies in the local Universe. While outflowing gas in neutral and ionised form had been observed in earlier studies, this was the first detection of massive outflows of molecular gas – crucial in the making of stars – being pushed away from a galaxy. The strongest outflows were seen in galaxies that host actively accreting supermassive black holes at their centre, hinting at a role for black-hole feedback in draining a galaxy’s reservoir of star-forming material. Further clues were found in nearby radio galaxies, which exhibit symmetric jets of plasma flying out, at the speed of light, from the central black hole. These jets definitely have the power to affect the gas on much larger scales and perhaps even to impede the host galaxy’s star formation. As for Herschel’s survey of over 12 billion years of star formation, a comparison with the simulated cosmos showed that some processes underlying galaxy evolution seem to be well understood, but many details remain unclear. Simulations are still far from reproducing the complex and diverse properties recorded by surveys of galaxies, especially concerning the link between feedback and star formation, and there is still much work to do before all pieces of this cosmic puzzle fall into place. Nevertheless, Herschel’s unprecedented observations are greatly helping astronomers in their ambitious endeavour of assembling the complex history of how stars and galaxies formed and evolved in the cosmos. Pushing the experimental boundaries farther than any of its predecessors, the mission has revealed a number of previously hidden gems, near and far, that have been crucial to piecing together this intriguing tale, while at the same time it also uncovered new mysteries that will keep astronomers busy for the foreseeable future. Herschel is a European Space Agency cornerstone mission, with science instruments provided by consortia of European institutes and with important participation by NASA. NASA’s Herschel Project Office is based at JPL. JPL contributed mission-enabling technology for two of Herschel’s three science instruments. The NASA Herschel Science Center, part of IPAC at the California Institute of Technology in Pasadena, supports the United States astronomical community. Caltech manages JPL for NASA. Astronomers first detected this system with the European Space Agency’s Herschel Space Observatory. It appeared as a single red dot in the telescope’s survey of the southern sky. These initial observations suggested that the apparently faint object was in fact both extremely bright and extremely distant. Follow-up observations with the European Southern Observatory’s Atacama Pathfinder Experiment (APEX) telescope confirmed these initial interpretations and paved the way for the more detailed ALMA observations. “Due to their great distance and dustiness, these galaxies remain completely undetected at visible wavelengths,” noted Riechers. “Eventually, we hope to combine the exquisite ALMA data with future infrared observations with NASA’s James Webb Space Telescope. The team is composed of Dominik A.Riechers (Cornell University, USA); T.K. Daysy Leung (Cornell University, USA); Rob J.Ivison (European Southern Observatory, Germany, and University of Edinburgh, UK) Ismael Pérez-Fournon (Instituto de Astrofisica de Canarias, y Universidad de La Laguna, Spain); Alexander J.R.Lewis (University of Edinburgh, UK); Rui Marques-Chaves (Instituto de Astrofisica de Canarias, y Universidad de La Laguna, Spain); Ivan Oteo (European Southern Observatory, Germany, and University of Edinburgh, UK); Dave L.Clements (Imperial College London, UK); Asantha Cooray (University of California, Irvine, USA); Josh Greenslade (Imperial College London, UK); Paloma Martínez-Navajas (Instituto de Astrofisica de Canarias, y Universidad de La Laguna, Spain); Seb Oliver (University of Sussex, UK); Dimitra Rigopoulou (University of Oxford, UK, and Rutherford Appleton Laboratory, UK); Douglas Scott (University of British Columbia, Canada), and Axel Weiss (Max-Planck-Institut für Radioastronomie, Germany). 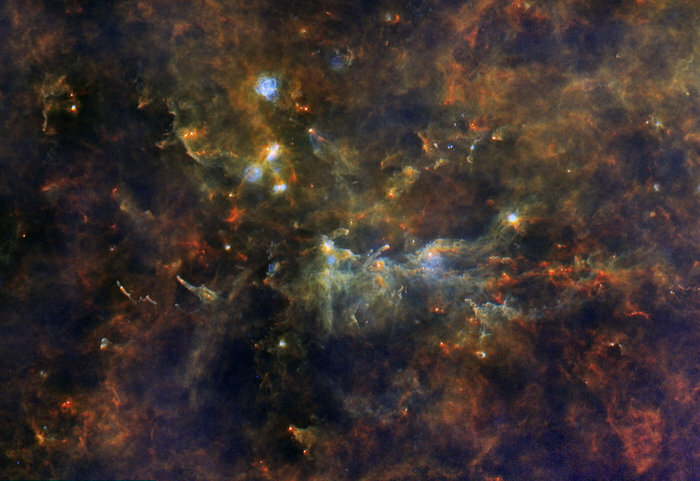 Stars are bursting into life all over this image from ESA’s Herschel space observatory. It depicts the giant molecular cloud RCW106, a massive billow of gas and dust almost 12 000 light-years away in the southern constellation of Norma, the Carpenter’s Square. A NASA-led team of scientists thinks the star — which is about 10 times as massive as our sun and emits about 20,000 times as much energy — is a newly forming protostar. That was a big surprise, because the region had not been known as a stellar nursery before. But the presence of a nearby interstellar bubble, which indicates the presence of a recently formed massive star, also supports this idea. New stars are the lifeblood of our Galaxy, and there is enough material revealed by this Herschel infrared image to build stars for millions of years to come. Situated 8000 light-years away in the constellation Vulpecula – latin for little fox – the region in the image is known as Vulpecula OB1. It is a ‘stellar association’ in which a batch of truly giant ‘OB’ stars is being born. This fantastic picture is a 70-170-350um composite image of the Galactic Plane at the longitude of 59° in the Vulpecula region. Most remarkable features that can be seen are shock fronts from HII regions, bubbles, Interstellar medium structured at all scales, and remarkable filamentary structures with on-going star formation.